The horn shark stolen from the San Antonio Aquarium was safely returned. 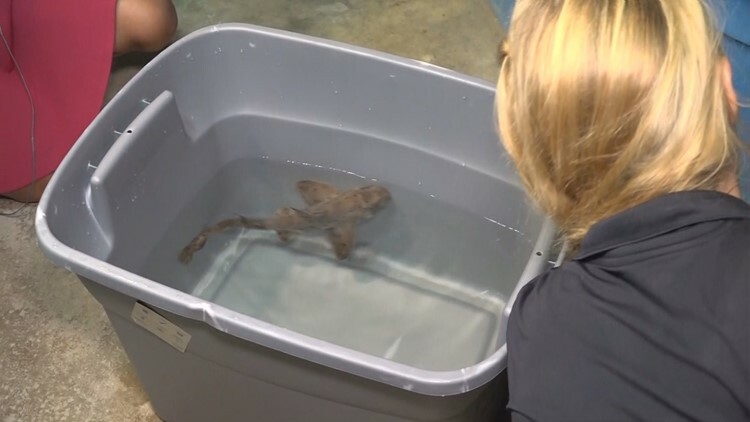 SAN ANTONIO — The horn shark "Miss Helen" stolen from the San Antonio Aquarium last month will return to its normal display on Saturday, according to the general manager. Miss Helen is eating again as of Friday night. The horn shark was struggling to maintain an appetite for some time after she was stolen. Shift Supervisor Sarah Hernandez is primarily in charge of overseeing Miss Helen throughout her recovery. "Definitely initially she wasn't very active at all," Hernandez said. "She was kind of in the same spot. Her color was a little off and so now her color is back and she's more active, so that's promising for us." She said that horn sharks can survive at least two weeks without eating. She said if this continues, the next step is to call in a veterinarian. "We've been trying multiple times a day with multiple different food types," Hernandez noted. "It generally takes them a little while, sometimes up to two weeks, after going through something like that to get back on a regular diet, so we're not super concerned at this point. We're still going to give her time to adjust to see if she settles in a little more if she will eat for us." Anthony Shannon, the man accused of stealing the shark on Saturday was charged with felony theft. Shannon spoke exclusively to KENS 5 and said that he was trying to save the shark. An online petition on Care2.com asking the aquarium to close its touch pool has over 24,000 signatures. The petition came about after the shark was taken from the pool. The petition claims that touch pools are "stressful for animals" and can cause injury or death to the sea life. The petition asks the San Antonio Aquarium to close the interactive touch pool on the premise that guests don't need to be able to touch the animals to appreciate them. We share our planet with millions of species of animals, many of which are threatened or endangered due to climate change, pollution, urban development, or a variety of other man made factors. Coral reefs are disappearing. Salamanders in Appalachia are shrinking. People killed an estimated 100 million sharks in 2017, far exceeding the number where populations can recover. At the San Antonio Aquarium, we live by the quote by Baba Dioum "In the end, we will conserve only what we love; we will love only what we understand and we will understand only what we are taught". We recognize that there is a huge problem happening in our world and things can only be improved through changes to the way we live our lives such as recycling, environmental protection laws, and learning respect, instead of fear, for many species. Our mission is to inspire the younger generation of ocean explorers and conservationists through education and a shared experience with live animals. With over 8,000 living animals representing habitats from the Oregon shores to remote Indonesian Islands, our hope is to instill respect and awe for our rich natural resources. In order to continue our works, we have to give the animals the highest quality of care. We do regular water testing, provide restaurant quality food for our animals, and work closely with and follow recommendations of veterinarians. We also monitor animal health and wellbeing throughout the day and give any animal who is not interested in interacting with the public its space, which does not happen often as our animals seem to enjoy the attention. Due to this, we have a very low animal mortality rate which is a great indicator that our animals are well taken care of. Another indicator of healthy, happy animals is our high birth rates in our breeding programs. We find that many more people are inspired after being able to physically interact with the animals and would like to invite anyone who questions their care and wellbeing to come out to our aquarium and check it out for themselves.